Life is full of amazing things. Some are funny, some are beautiful and some are just awe-striking. These things can be anything from tiny flowers to towering mountains, baby birds to enormous elephants. I have many wonderful things outside my window, where there is an incredible view and a vast range of wildlife. Yet I sometimes take these things for granted. I shouldn't really because I have a lot more amazing things outside my window than most people have. We live on a mountain side in South Africa so naturally I have a great view of an awesome mountain. 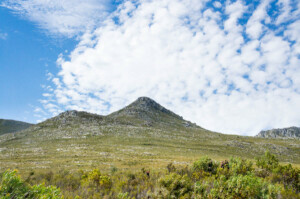 The mountain is covered in a unique type of bush called Fynbos. On our 600 acre plot alone there are around 500 different species. Up close, there is a huge variety of colour, mainly greens and browns, but often whites, reds, pinks and even sometimes there are blues. But when you look at the mountain from a distance it's a vast carpet of khaki green dotted with rocks. It's amazing to think that that carpet of green is so so many species of unique plants. In the two years we have been here I have seen a vast amount of wildlife outside my window (not to mention everything else I've seen in the many places we've been to). One of the most recent things I enjoyed watching were two baby starlings that were nesting right up on the wall just outside my window. The parents were very protective and whenever I poked my head out of the window I would get bombed! There were also some martins nesting nearby, who were equally protective of their young. Once I was getting bombed by the starlings, while the starlings were getting bombed by the martins! 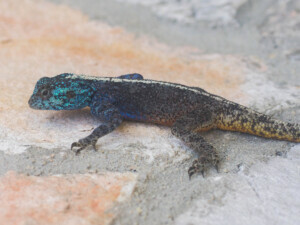 In summer common residents are lizards and wasps. The wasps come to cool down from the heat and they sit on my window. This means I get an excellent view of them. Instead of being yellow and black they are orange with white-black-white strips. They have a huge abdomen and really long antennae. The lizards are always running past my room. As well as lizards I get skinks which are basically lizards with smooth scales. I took great delight in trying to take a photo of them with my little camera (I never got a decent photo – mainly blurred tails and blank patches of grass – but, hey it was fun). In the evenings of the very first summer we were here I used to get cape scrub hares outside my window, feeding on the grass. It was amazing to see them there, especially as it was only on an extremely rare occasion that I saw hares back where I used to live – in England. Here they got used to me and I took great close up photos. For some strange reason we have never seen them there again. Once or twice I have been lucky enough to see a duiker (a small type of buck), eating the grass outside the window. They are rare but happy moments. 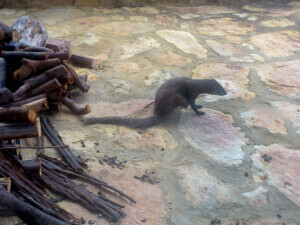 Slightly more frequently I see Cape grey mongoose outside the window. They are really lovely to watch, snuffling around the grass, and they always bring a smile to my face. They are I think among some of my favourite animals. 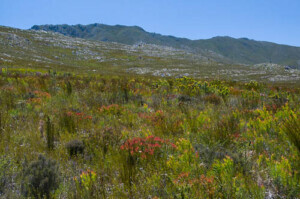 Along a more funny line, one morning I woke up to find that there were cows out the window munching on nearby Fynbos. These particular cows were a nuisance in the area and had been trespassing here before! I can't remember whether they wandered back of their own accord or not but it was pretty funny. 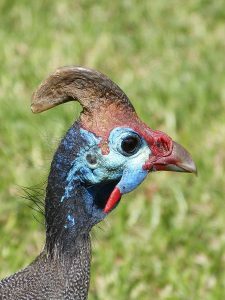 Also I once had a type of bird called a guinea-fowl outside. They are very stupid birds, as I soon found out. One of them decided it wanted to go through the window, so it flapped into it. Of course it couldn't get through, so it walked up and down next to the window as if it were thinking, then it flew into the same window again! It repeated the process again; flying into the same window, before it finally gave up and flapped away!! I also love to hear the wind howling round the house and the rain pattering on our tin roof on winter nights. All year round, I often keep my curtains wide open. On clear nights, because there is no light pollution the stars are absolutely amazing. Though my view of stars isn't the best in the house, there are still some really cool things about my view. 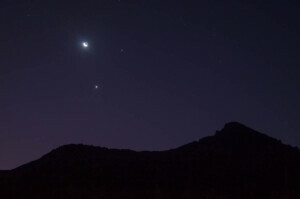 For one, there is a planet (Venus I think), that I can see from my bedroom really brightly and it is easy to pick out. At some points in the year I am able to see the constellation Orion from my window. 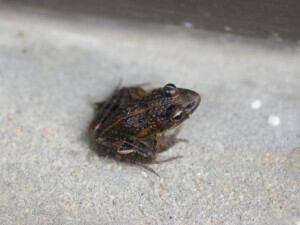 Sometimes I am even lucky enough to see shooting stars! All this makes me think that it's obvious that the world wasn't made by chance. It was made by a loving and creative God. And that God made everything Outside My Window. 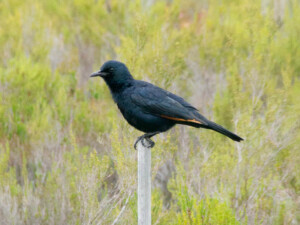 bird, common duiker, frog, fynbos, guineafowl, hare, lizard, mongoose, rock martin, scrub hare, starling. Bookmark.